The World’s Finest caught up with illustrator and artist James McLean to discuss the special 10th anniversary issue of the fan-comic Batman: Dark Knight Adventures. Batman: Dark Knight Adventures was a regular fan-based comic series available right here at The World’s Finest, which ran in the Early 2000s. The special 10th Anniversary issue “Enlightenment” brings the new Batman: Dark Knight Adventures content back to The World’s Finest after a lengthy absence. Click here to check out more Batman: The Dark Knight Adventures content. McLean is a freelance illustrator and video game artist residing in the UK, well-known for his illustrations in assorted books, magazines and video games, including video game titles based on both Doctor Who and Star Wars. Continue below for more from McLean, as he discusses both his past work and the new Batman: Dark Knight Adventures – 10th Anniversary Special. The World’s Finest: Can you tell us a bit about yourself, Batman: Dark Knight Adventures and why you were inspired to do the comic in the first place? James McLean: Ian Moore – one of The World’s Finest young, aspiring, speedy editors asked me back in 2003. 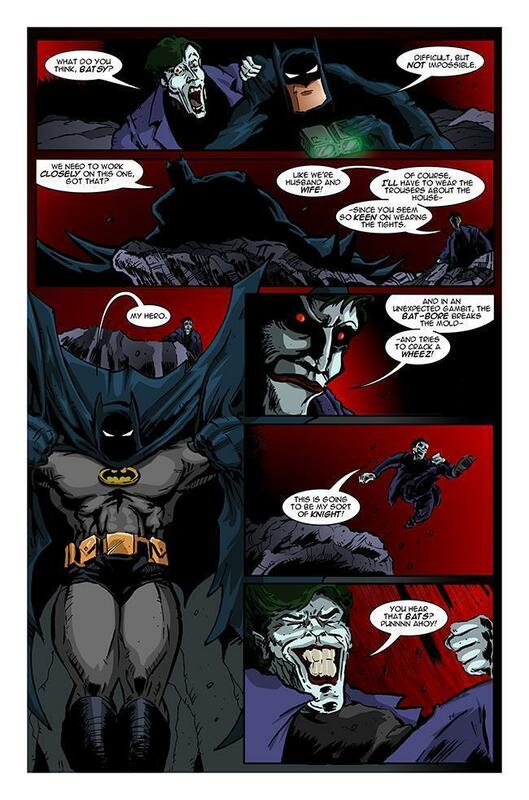 I was starting university, and he said he wanted to do a Batman online comic as part of the website. Given I was off to study illustration – and I rather liked the Batman cartoons – it sounded a challenge. I like challenges. This was a big challenge as most fan-based ideas tip over and fail before they reach the starting line. I came on as penciller and inker, we had a gent called Romain Ronzeau, a very talented French artist as cover artist, and a girl going under the moniker “Maggie Rose” as writer. I think Ian colored/lettered initially. About three or four issues in, Maggie’s storyline had managed to wrap rings around her head and was squeezing her brain to mushy mush, so I stepped in to finish off what she started. It was all to do with a Monster who looked a bit like Bruce Wayne. I’m not quite sure what her plan was to resolve it, so I made some decisions and resolved it my own way. That story became part of what Batman: The Dark Knight Adventures was all about and we referenced back to it several times. I guess the ‘Monster-Wayne’ was our own little oddity. After that the line-up changed. I ended up writing permanently – bar one special which was written and illustrated by Romain. Kris Trigwell joined us at the back end of the ‘Monster’ arc to color and letter, and became my right hand guy – he was my Bob to my Joker. He was great at spotting ways to tweak dialogue or add in even more continuity references! WF: What type of freedom did Batman: Dark Knight Adventures give you when exploring the mythos of your favorite DC cartoon titles? WF: It’s ten years later – why return to Batman: Dark Knight Adventures? How much have you evolved as a writer and artist from the last DKA installment to this new 10th anniversary special? JM: The comic touched a lot of people. Not just myself, Ian and Kris, but many who read it – and it’s still being read. It seemed we owed the project a birthday anniversary. I’d talked to Ian earlier in the year about doing something, but to our shame, we had flaked – and I don’t think I was happy about that. I came back to Toon Zone a couple of months ago and I think somehow that reminded me how important Batman: The Dark Knight Adventures and my time around the Toon Zone/The World Finest websites had been to me. I owed Batman: Dark Knight Adventures some sort of celebration. I’d had a hard year with a lot negative vibes and coming back to old haunts, I could feel the positive energy. I had a lot of good times in the toon/comics fan-community and on some level I always feel I owe it. It gave me friends, it gave me opportunities, it spurred on a fascinating art career – even bore a relationship. When you’ve had a bit of a negative year, sometimes you need to find some of those places in your life that harbor good energies. Batman: The Dark Knight Adventures had good energies, so perhaps in a way, giving Batman: The Dark Knight Adventures a good celebration was as much for me as it was to celebrate the comic. The new “Enlightenment” story we’re publishing is a story I wrote and drew a few years ago. I think it’s very much an evolution on Batman: Dark Knight Adventures, certainly I spent more time on refining it than Batman: Dark Knight Adventures ever got. I have a brand new story for Batman: The Dark Knight Adventures that we’ll release this year – I think given its done on the same sort of rushed, on-the-fly, approach, the style and structure is more advanced than Batman: Dark Knight Adventures was. So yeah, I think I can see some evolution from back in 2003! Thankfully! WF: Batman: Dark Knight Adventures amassed a very dedicated following during its original run – do you think that gives credence to fan comics? JM: It did have a big following. Majority, as with all followings, are quite silent. Ian was recording millions of hits in its day, literally millions of hits. I don’t know if it gives credibility to fan comics, I think we were one of the few fan comics that proved to be the exception to the rule in terms of how much material we amassed. I recall in terms of web-comics, we weren’t popular with other authors [laughs]. There was a feeling we were lazily piggy backing another artist’s work and gaining attention artificially. I can see where they were coming from, a lot of web-comics work hard to promote their original ideas and we were automatically going to have a fanbase from Batman fans, but I don’t think that made what we were doing either lazy or easy. In fact working around an established idea can swing back and knock you on your proverbial arse. You do a comic based on an established, quality and professional concept, and you raise the benchmark for expectation that you don’t get when you run your own unique idea. So while we did naturally get more attention than we would if we’d done our own comic idea, we were automatically being judged against very professional material. By and large, I think we did okay with very positive feedback, which given it was always done on the fly, in a rush and between student projects, I’m quite pleased about. We were just trying to give fellow Bat fans something to enjoy, something that would test our skills and most of all, show those who made those wonderful DCAU shows how much their work had touched us – and they were aware of it (we spotted a few key names silently browsing the comic threads!). We weren’t looking to challenge or prove we were special, we certainly didn’t mean to tread on any fellow web-comic’s toes! WF: You took great pains to make sure Batman: Dark Knight Adventures fit in the continuity of the source DC Cartoons material. How do you see them in the overall grand scheme of the animated DC universe? A neat side project? An exercise of love? Something more? JM: All of them. It helped me hone some skills as a university side-project, and yeah, it was a big exercise of love. I remember walking the beaches of England planning ideas stories and drawing them in the oddest places (on the floor, sleeping rough at an airport being the oddest) – and it did become something more, it enveloped me. The plans, the ideas… it was fascinating. In a way it was more fascinating than doing your own work, because there were limitations of an established product to work around, so the art of writing was more in the design than the originality – how could you write stories around stories? That made it more fun because you were thereby able to toy and play with people’s conceptions and expectations of the established characters. Greatest thrill for me in writing on Batman: The Dark Knight Adventures was the Batman Beyond news-strip, and I knew at the get-go that 50 strips down the line the reveal was going to be The Spectre as a key character – and it was vital that people didn’t guess that… but if you don’t give clues to pre-empt such a reveal it becomes left-field almost quite literally, deux ex machina. So that’s over a year writing, hoping, you can structure the story than will carry you twelve months to a reveal no one will have guessed publicly and ruined the twist. No one did guess and the reveal went down well as I recall. That story was a wonder to write. As for continuity, I saw a thread recently on the The World’s Finest forum that actually placed them into continuity, that’s a huge compliment. No – they aren’t canon, they’re canon if you personally want them to be. I remember one guy who sent me a photo of his Bat-Joker he’d created as a 3d model based on the design I did for one story, that was a thrill and an honor. If people accept them as canon, I think that’s cool – and if you’re open minded enough I do think they add to the DCAU continuity. The Batman Beyond news-strip is possibly my favorite of all. It’s got a classic writing structure, some good twists and loads of fan references. I think it also manages to bring Terry back from the dead after we killed him without feeling it cheapening the original story. There’s always a price to pay for revival stories, if you bring someone back, there has to be a price, I think our price fed into Epilogue rather neatly! WF: Can you tell us a bit more about this special 10th anniversary comic? And…will this be the last Batman: Dark Knight Adventures? JM: The story is actually a brief I was hired to do for a French comics trade magazine that wanted to run a fictional one-off fictional tale with each issue. They wanted Batman for the first issue and asked me. I was very enthusiastic and naive – I rushed in where fools dare to tread, pulling along with me Kris Trigwell. We finished the comic to find the editor had been dismissed and he’d failed to get the license from DC so the comic was no go for a commercial publication. I felt an idiot. No paperwork, no editor. So this story Enlightenment has sat unused and unseen for years. It seemed the 10th Anniversary of Batman: Dark Knight Adventures was a good reason to give it an airing. It’s not technically Batman: Dark Knight Adventures continuity, though I did intentionally use some Batman: Dark Knight Adventures stylizing in the Batman character within the tale as homage to the cartoon show. I’ve read it back for the first time since writing it and I’m actually quite pleased with it. It’s a good Joker tale and Joker is always fun to write. Is it the last? No. It’s one of the last. After “Enlightenment” we have two stories for this anniversary. One is akin to the Batman Beyond news-strip format that focuses – oddly – on Kara (Supergirl). It was written just after the Batman Beyond news-strip finished and was never completed. I think Kris was feeling tired and burnt out, and it didn’t perhaps feel a suitable or relevant epilogue to the Batman Beyond news-strip and Batman: The Dark Knight Adventures comic. They had good endings. But now, as a Birthday celebration of the project, I think it’s worth finishing. Ian’s coloring that one. It’ll be a 14 page story. The other story is one I decided to do after offering “Enlightenment” to World’s Finest. Reason being both “Enlightenment” and the Kara story are old material. I wanted us to do one new, original tale for this year. I’ve been jamming in a page of art a week and so far have 7 pages complete of a 14 part tale. Kris has offered to color and letter it. He likes the story. I like it too – it’s different to what we’ve done before but follows all the guild-lines of a good DCAU fan-comic – it has continuity references and a couple of ideas that perhaps bridge gaps in the official DCAU timeline! So a couple more stories after this and that’s your lot, till maybe the twentieth birthday! WF: And, to wrap it up, care to tell us what you have coming down the pipeline? JM: Well I tend to work in video-games these days supplying art for pre-production as well as in-game material. I’m working on three games currently for tablets and phones, which really is the future of video games I think. Well I guess if we’re talking web-comics, I did a comic idea called Foxhell last year. Just like Batman: Dark Knight Adventures, a project wedged in between projects. An idea to have fun with that I might develop further. You can read at http://foxhellcomic.wordpress.com/ . On top of that, seems my meddling in fan-realms took a new level of madness and I began a campaign to bring back a TV show back called Millennium called “Back to Frank Black.” Ended up good friends with actor Lance Henriksen through that and we did a book last year which I wrote a chapter for an illustrated throughout. That’s on sale and all profits will be going to Lance’s chosen charity ChildrenoftheNight.org – read more of that project at backtofrankblack.com. And if you’re not totally sick of me, I do some work at the Doctor Who web fanzine Kasterborous.com – I do a weekly podcast there and we released the first issue of the site’s magazine. I’m working on the designs/layouts/content for issue two right now – that’s an odd experience that is stretching me in different ways. There’s a big different between illustration and layouts, learning very much on the fly, but like with Batman: Dark Knight Adventures – sometimes that’s the most exciting way to work! 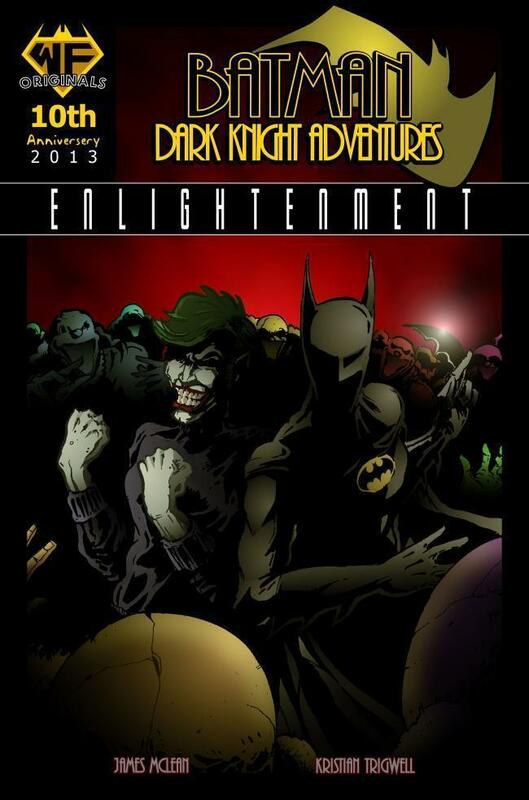 Click here to read the Batman: Dark Knight Adventures 10th Anniversary Special “Enlightenment.” The World’s Finest would like to thank James McLean for his time, effort, and participation. Discuss this interview and Batman: Dark Knight Adventures at The DC Animation Forum! Warner Bros. Animation has provided the following scholarship details for those interested in pursuing a career in animation. Continue below to view the press details and how to get more information. Who: Any graduating high school senior enrolling in a college, university, or trade school to study animation. What: Through the Warner Bros. Reach program, one outstanding student is awarded the Hanna-Barbera/Animation Honorship each year that includes a scholarship and four full-time paid internships at the company during four consecutive summers while enrolled in college. Successful Reach program graduates will be eligible for full-time positions at Warner Bros.
How: Application (with instructions) can be downloaded by clicking here. Discuss this on the Toonzone Forums! The World’s Finest has learned that animation producer, writer, editor, and comic industry vet Dwayne McDuffie has passed away. He was 49 years old. McDuffie died Monday, February 21st, 2011, a day after his birthday, due to complications after undergoing emergency heart surgery at Providence St. Joseph Medical Center in Burbank, California, said Gary Miereanu, a publicist for Warner Home Video. McDuffie is remembered for his work with Milestone Media, classic animated television programs including Justice League Unlimited, Static Shock, among many, many others. His most recent projects included the animated series Ben 10 and the just-released All-Star Superman direct-to-video animated feature. A highly influential creator in his field, his work was noted by many others as the high mark to which they aspire to. McDuffie recently attended the Paley Center Los Angeles premiere of All-Star Superman, which was held last week, and was active across his website and social media accounts as of this past weekend. All-Star Superman, which was officially released today, was his latest long-form animation project, though he had at least two others in various stages of development. This news has hit both his colleagues and the fan community tremendously hard. Other media outlets have also picked up this tragic story. 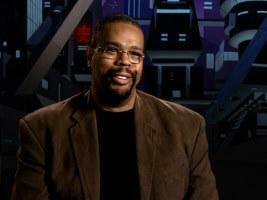 Dwayne McDuffie is survived by his wife. The World’s Finest would like to express our deepest condolences to his friends and family. Click here to discuss this news. The complete main cast and crew rundown for the All-Star Superman direct-to-video animated feature, as listed in the official credits for the new DC Universe Animated Original Movie animated feature, are as follows below. Further extensive coverage on the All-Star Superman release is forthcoming here on The World’s Finest. 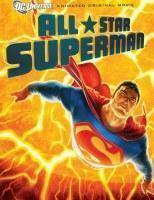 Click here for The World’s Finest review of the All-Star Superman animated feature and Blu-ray disc release. Click here to view the trailer for the All-Star Superman animated feature and click here to view the All-Star Superman subsite. In further All-Star Superman news, Warner Home Entertainment and The World’s Finest has teamed up to giveaway five Blu-ray editions of the highly-anticipated All-Star Superman direct-to-video animated feature, available everywhere February 22nd, 2011. To enter, simply send an email to bbeyond@yahoo.com including your name, mailing address and phone number. Additionally, please label the email “All-Star Superman contest.” The contest runs from 12:00am (ET) February 15th, 2011 to 12:00am (ET) February 23rd, 2011. Only the winners will be contacted upon closure of the contest and recipients selected. Please note this contest is open to Canadian residents only. In All-Star Superman, the Man of Steel rescues an ill-fated mission to the Sun (sabotaged by Lex Luthor) and, in the process, is oversaturated by radiation which accelerates his cell degeneration. Sensing even he will be unable to cheat death, Superman ventures into new realms finally revealing his secret to Lois, confronting Lex Luthors perspective of humanity, and attempting to ensure Earths safety before his own impending end with one final, selfless act. The celebrity-packed voice cast is headed by James Denton (Desperate Housewives) as Superman, Christina Hendricks (Mad Men) as Lois Lane, and Anthony LaPaglia (Without A Trace) as Lex Luthor. The stellar cast includes seven-time Emmy Award winner Ed Asner (Up) as Perry White, Golden Globe winner Frances Conroy Six Feet Under) as Ma Kent, Matthew Gray Gubler (Criminal Minds) as Jimmy Olsenand Linda Cardellini (ER) as Nasty. Arnold Vosloo (The Mummy), Catherine Cavadini (The Powerpuff Girls), Finola Hughes (General Hospital), Alexis Denisof (Angel), Obba Babatunde (That Thing You Do! ), Michael Gough (Batman) and John DiMaggio (Futurama) round out the voice cast. All-Star Superman, the latest entry in the popular, ongoing series of DC Universe Animated Original Movies, arrives February 22, 2011 from Warner Premiere, DC Entertainment and Warner Bros. Animation. The highly-anticipated, full-length film will be distributed by Warner Home Video Canada as a Blu-Ray Combo Pack and 2-Disc Special Edition DVD, as well as single disc DVD. The film will also be available On Demand and for Download. Stay tuned for further All-Star Superman updates here soon at The Worlds Finest. The 2008 Holiday Season is now upon and with that comes the end of another big year for fans of DC Animation. We had quite a topsy-turvy year full of major highs and major lows, including some huge fan-anticipated releases and some popular cartoons and comic books coming to an end, marking the end of era for many fans. On the upside, the score to assorted Batman: The Animated Series episodes received the soundtrack treatment this year with the first of many possible CD soundtrack releases. Batman: The Animated Series also had a lavish “Complete Series” 17-Disc DVD release hit shelves in November. DC Animation fans also enjoyed a host of new animated projects this year, including Justice League: The New Frontier, Batman: Gotham Knight, and Batman: The Brave and The Bold. On the downside, we had two shows come to an end, The Batman and Legion of Super Heroes, and, with that, we also lost four animated comic titles, as well. The Batman Strikes!, Legion of Super Heroes in the 31st Century, Teen Titans Go! and Justice League Unlimited all printed their final issues this year. We lost so much, but, thankfully, theres a lot going on right now, as well as new projects on the horizon, that should fill the void left by the departure of these comics and animated series. Now, much more happened this year in the world of DC Animation, but the above is just a quick overview of some of the major events of 2008. While 2008 passed by quickly, it was a busy year here for all of us. New movies, new television series (more of both to come in the coming years, by the way), new comics, all of which has kept us both busy and talking. And, as we wind down the year, wed like to inform everyone that the news staff here at The Worlds Finest will be taking a two-week holiday vacation to recoup from a very busy year. In fact, the staff has been working overtime to provide a solid months worth of news before taking a holiday sabbatical. There will be no regular daily news updates posted, beginning today, until we return on January 5th, 2009 with a whole new year of news to report. However, there will still be the occasional news story to report between now and then, so be sure check back over the next two weeks. While our regular daily reporting will be suspended for the next two weeks, we will also still report on any major developments during that time if they arise. We may even drop some news on the forums, too. On top of that, we’ll still be around to answer any emails, PMs, or forum posts! Outside of the news, The Worlds Finest has many plans already underway for the new year, including new features, new subsites (such as the long-delayed Legion of Super Heroes subsite), and much more. In fact, we have a very cool surprise for Batman: The Animated Series fans coming before the end of the year, so keep your eyes peeled. January 2009 will see the kick-off of our 10th anniversary celebration for Batman Beyond, and thats only the beginning. Remember the Wonder Woman direct-to-video animated feature isn’t far behind, arriving in March 2009, and we have lots of exclusive Batman: The Brave and The Bold content planned for 2009. We have some great stuff planned for both The Worlds Finest and our spin-off site The WF DVD Report for the coming year! Stick around and keep checking back. Oh, before we forget, if you have any site updates you’d like to see, please PM (via the forums) or email Bird Boy and/or James Harvey. We’ll get to them quicker that way! Now, in the spirit of the season, we here at The World’s Finest would again like to wish everyone here a great holiday season! Why not pop in Justice League‘s “Comfort & Joy,” or Batman: The Animated Series‘ “Christmas with the Joker” and “Holiday Knights” to celebrate this festive time? 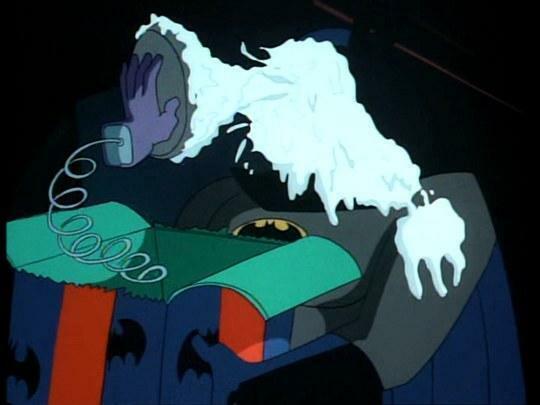 And why not crack open some of the holiday-themed Batman Adventures comics? There are some great stories to be read there. Wed also like to thank the strong creative teams of our favorite programs, movies, and comics for providing a year of great entertainment. Whether its the direct-to-video features, the animated television series, or the comic books, weve had a lot to talk about, and well have a lot more to talk about next year! There’s more DC-themed cartoons and animated movies coming down the pipeline with major announcements right around the corner! It’s been a great year here and we’d like to thank everyone who has made stopping by here everyday part of their daily ritual. We strive to do our best, even when it seems like there’s too much on our plate and not enough hours in the day, and we are honored to retain our status as both the No. #1 largest DC Animation site and Batman animation site on the net. To those who contribute and provide content for the site, to those who post on the forums, etc., wed like to express our sincere thanks for helping us build a better site. There’s a lot more to come in 2009, so stick around!